NOVEMBER 2014. In that winter of his reign as Lanka’s self-acclaimed king, Mahinda Rajapaksa felt the first harsh gust of cold wind threaten the family tree: and saw, in that season of his decline, the first ominous signs of the birds that had swarmed round the fruitful abode of plenty now deserting in flocks, flying pell-mell in droves from the boughs upon which they had once perched and feathered their nests, to that evergreen meadow of the still unborn spring, to make their early call on that verdant pasture under the canopy of a familiar blue. He realised that naught but his expressed willingness to blow the whistle on what they would leave behind, damning evidence of the shells of eggs from which they had sucked the golden yoke dry, would halt the exodus of the black ravens’ flight. And on 23rd November 2014, three days after Maithripala Sirisena had announced his candidacy, he threatened to unsheathe his Excalibur, his faithful sword of secrets, if they didn’t cut their flight in midair and return forthwith to the Rajapaksa fold to make the Rajapaksa tree bloom again with fruit for yet another record breaking season. But dew rusts unsheathed swords and blunts its cutting edge. And Rajapaksa artfully declined to draw it. Its time and place would be elsewhere. He knew its’ terrible power emanated not from use but from being kept sheathed. To merely state he possessed it, sufficed to make the sweat pour down the brows of the guilty and provoke goose bumps to rise on their flesh. That is the power of secrets. A man’s dark secrets could be used to hold him to ransom, his soul made slave to the knower of his indiscretions, who had the lowdown on his unsavoury past. But the potency of secrets, alas, only lasts till they are kept secret for if divulged it would cease to remain a secret; and though its revelation may cause the desired conflagration, the secret itself would self destruct and be useless thereafter to its possessor. Thus it has to be used with care, for it can be used only once. And Mahinda Rajapaksa knew on that November afternoon, the secret of power of secrets and how best to use it. But at whom was the warning aimed? For whom, did the bell toll? Was it just to show off his magnanimity, that even though he had the dirt on them, he would not soil his hands by using it? Or was it a coded message, only those who had the encryption key could decipher; and know full well to whom the arrow was meant to be? His implied threat, gloved in velvet, appeared at that hour to be addressed directly to the SLFP MPs and senior ministers who had braved the expected wrath and the exposure of any wrong done to decamp with Sirisena – and many were of the opinion that it did so too. But was it? What did the first crossovers have to lose? The original ‘betrayers’ had razed their homes and burnt their boats and set the bridges afire when they plunged into the raging waters of the river of no return, the Rubicon. There was no going back. They would have known of the consequences, the fallout of their bold actions. For, in their heart would remain etched, the litany of their corruptions, if any. More than any file could reveal, their conscience would contain the secrets of the dossier to help them determine the odds on the gamble they were to make and whether they could afford to take the risk of crossing over to the other side of the highway. If there was anything in the files, Rajapaksa professed to have in his custody, would it have held anything that would have incriminated them – alone? Perhaps it was this knowledge that emboldened others to follow in the steps of the Pilgrim Fathers in their perilous journey to find Avalon and establish just governance or perish in the noble quest. They could well afford to call the Rajapaksa bluff. And treat it as a desperate attempt to blacken their good names with corruption with the uncivil sport of mudslinging. Irrespective of Rajapaksa’s assurance that he will not make use of the files in his possession, secrets are known to have an ingenious way of their own to emerge from their sepulchres and see the gaudy light of day. But that didn’t stop the Maithri clique from hitching their fates to the Sirisena star. But what of the others who remained in the fold? Did any skeletons in their closets make them rattle and bade them stay? Instead of drawing out his Excalibur of Secrets and unleashing its wrath on those who had crossed over with Maithripala and following a ‘let bygones be bygones’ policy, did Mahinda Rajapaksa, standing on a crumbling podium of defeat, with foresight turn his focus on those remaining disciples and adroitly transform his sword to that of Damocles and placed ‘the sharpened sword over their heads hanging there by the thinnest simple threads’ to command their future allegiance, to rally round him even in defeat and do his bidding to make him return in triumph? And as things would have it, the Maithripala government has provided all the mechanisms needed to let the sword fall with cutting effect. But the Bribery Commission and the FCID appear to be running round in circles trying to gather the necessary evidence to warrant conviction in court. A complete dossier containing names, dates and amounts, signed and sealed secret documents that would prove the guilt of an elusive Rajapaksa rebel member not only beyond a mere 200 per cent of doubt – as the prime minister wants it to be – but beyond 1000 percent doubt would indeed come in handy to the investigators should it fall like manna from the heavens or emerge mysteriously like a toadstool from the Rajapaksa secret vault of secrets. President or no, Mahinda Rajapaksa still retains the power, albeit courtesy of Sirisena’ s government agencies, to make use of his secret files and, should he ever choose to do so in the event any of the pack strays beyond the parameters and fails to hark the summoning whistle, to implode any member of his own regime with corrupt hands and smudged record, with the dynamite contained in the files locked in his safe, to damning and devastating effect. Is that the secret of his success that makes the hungry ravens still caw round the old barren tree? For though there may be no sweet fruit in season now, the alternative facing them is to eat of the bitter gourd of sin to atone for their transgressions; and to dwell not in cosily feathered nests they once knew but in vermin infested dinghy cells as government guests. If that’s the awful plight of several Rajapaksa rebels, phew! What a boiling cauldron of soup they must find themselves in today. As the Roman orator Cicero once said ‘there can be nothing happy for persons over whom some fear always looms?’ The bad news is the cauldron heat is set to rise. To a new high that President Maithripala will determine at his pleasure, though, this time, it will not be in his own cool time. For events have come to a pretty pass that would tax the earned patience of a sage. And the President has come to the end of his tether. Impudent threats made by Rajapaksa rebels to break away from the SLFP and form a new political party to challenge the old, have snapped the last sinews of Sirisena’s tolerance. He had borne every provocation with resolute calm, weathered every resistance with plucky resilience and swallowed the insolence, chewed the calumnies hurled at him by the defeated and had spat them all out without malice, in the magnanimous noble spirit of the supremely triumphant. But, alas, it had been to no avail. The rebels were beyond the pale, too fixated with their own survival to heed any call to heel. Last Friday eve at Matara, addressing a joint SLFP-UNP rally in the southern stronghold of the Rajapaksa kinfolk, held to mark the first anniversary of the joint government, a visibly exasperated President Sirisena gave unbridled vent to his pent up rage over the joint opposition rebels’ attempts to sabotage the nation’s agenda at every turn; and to frustrate and make a mockery of his efforts to make Lanka meet and rise above the crisis the Rajapaksa regime bequeathed him as their legacy after ten years of misruling the roost. Then throwing down the gauntlet, President Sirisena drew his Sword of Secrets and raised the battle cry that should the joint opposition sever the umbilical cord and decide to go it alone and form a new party, the secrets that slept coiled in his Sword of Excalibur, so far sheathed and so far left undisturbed would be kindled to awaken to life to strangulate with a serpent noose of secrets, the life and breath of the new born upstart. 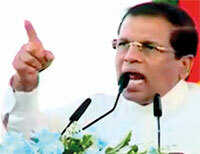 President Sirisena said: “ We shall never allow those who destroyed this country, those who destroyed democracy in this country, those who engulfed the whole country in a fear psychosis with their white van culture, those who, in the midst of the country’s 9000 billion rupee debt crisis, they themselves created, robbed millions, billions from the country, those who practiced fraud and corruption on an unprecedented scale as never had been done in this country and crowned fraud, corruption and waste, we shall never allow them ever to form a government in this country again and I say this very clearly, say it very clearly. No doubt the President’s outburst is understandable and one can easily sympathize with his pain of mind. Unlike the other presidents, he had enjoyed no honeymoon, no interlude to toast his victory. Only the vitriol brimming chalice had been proffered to him to sip. From day one of his tenure it had seemed almost as if he had been involved in acrimonious divorce proceedings; with the wife’s former husband, though booted, still trying to usurp the marital bed and claim conjugal rights. 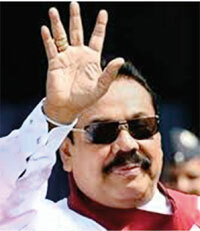 The first four months of his presidency had been gobbled up by the diabolical campaign to ‘Bring back Mahinda’. It had nearly buckled his efforts to keep the pledge he had made to the nation to abolish the draconian 18th amendment to the constitution; and it had been with the greatest difficulty he had secured the vital two third majority to approve the 19th amendment bill. The next three months had been dedicated to the task of denying Mahinda the PM post he sought as the basis for his comeback. But even after the Lankan public had prevented the former president from realizing his ambitious goal, the manic antics had not stopped. One year has passed since a new parliament was elected. It seems all that has occupied the president, the government and the people throughout these last twelve months has been the actions of the joint opposition and the reactions of the government to it. The last few months saw mayhem in the House, stage-managed to disrupt the proceedings when government bills were being debated; witnessed coconut dashing rituals attended with curses to damn the government out of existence; noted the rebels’ unilateral declaration of independence from the ruling twin SLFP and the formation of the so called joint opposition; sat through the five day downhill crawl, or the Pada Yatra, from Peradeniya to Colombo, enlivened only by some bouts of baila dancing on the streets: with the entire drama staged for the sole declared purpose of bringing down the duly elected one year old government upon reaching the capital. And all this done on the pretext of promoting the public weal and safeguarding the people’s rights when it is abundantly clear that their real and main purpose is to plunge the nation into chaos and ward off the day of judgment: when the wages of corruption fall due for payment before the stern bar of court. Weerawansa’s threat in his hysterical speech at the Lipton Circus on August 1st, that the Government must stop ‘the political witch-hunt’ of the Rajapaksa rebels or else they would lay siege on Colombo and bring the nation to a halt, reveal the true motive beneath the sham protests. Now their latest stratagem to split the SLFP by the formation of a new party has provoked the president’s ire for it threatens to weaken his own power base and possibly to cook his goose come the next election. But it may possibly backfire and cook the gander for the rebels too. For uneasy must lie the heads that wear the thorns of corruption. And today the rebels must find themselves in the excruciating position of being impaled upon two swords. The Excalibur of Maithripala ready to strike if the rebels follow the latest craze and, abandoning the mother ship, jump aboard the still submerged Rajapaksa catamaran. Mahinda’s Damocles ready to drop if they don’t. Maithripala Sirisena’s sacking of 40 members of the rebel group last week as SLFP’s main electoral and district organizers may well make many in the joint opposition group to walk the plank. Two or three senior members, possibly embarrassed to remain on the deck . while others were castaway as jetsam, have voluntarily jumped overboard whilst others may soon follow suit. The president’s threat to expose anyone who mutinies has also led to calls demanding he reveals the secrets to the public. But what real purpose, other than sating the people’s thirst for the lowdown on the infamous damned, will that achieve? Except, perhaps, to cast him in the role of a gossip monger making wild scurrilous accusations whilst protected from defamation suits by the shield of presidential immunity. What is more important is to convey the dossiers to the investigating agencies and thus ensure that the promised crackdown on corruption is made, is pursed to the end without any let up with the guilty subjected to the due process. What is vital for President Sirisena to do, as leader of one of Lanka’s two main parties, is to ensure corrupt members are not granted a safe haven in the SLFP harbour, even for the sake of party unity. Or else the people will only be witnessing to their horror and deep dismay, the recent sordid history of the SLFP repeating itself unabashedly under a regime that professes to hold the Yahapalana doctrine as the bedrock of its actions. There’s nothing more dangerous than when the corrupt unite to gain and retain the purple seat of power. As an example of just how crass a nation can be when it comes to respecting the sovereignty, territorial integrity of another nation and the sensitivities of its citizens, look no further but down under at Australia, the antipode of all that’s civilized and refined.Last week the Australian High Commissioner replied to the Sunday Times report published a week earlier of how the Australian Government has listed Tamil Eelam in their census. Regrets that internal guidelines were placed in the website apart, the Australian High Commissioner’s position is that Australia’s national census did not recognize ‘Tamil Eelam’ as a separate country. Of course. How can any government or even an ‘ocker in a blue singlet and rubber thongs with a tinnie in his hand propping up a bar’ from the outback recognize a country called Tamil Eelam which does not exist? What on earth gave them larrikins that preposterous idea? Why not connect Tamil Eelam to Canada, to France, to Germany, to Tamil Nadu in India or even to Australia itself where a large number of Tamils dwell, when anyone lists country of birth as Tamil Eelam? Why Lanka? Is this not a tacit recognition that a de facto state of Tamil Eelam exists in Sri Lanka? Today all the democratically elected representatives of the Tamils of Lanka have forsaken the pursuit of this utopian dream for which a terrible terrorist war was fought for over thirty years and cost thousands of lives. An extremists’ fantasy that had to be paid in blood. Today only extremist racist groups and the terrorist residue still harbor the hope of resurrecting the spectre of Eelam on Lankan soil. They yearn for recognition for their infernal goal and every crumb of acceptance, every bestowal of seeming legitimacy they can get to foster their diabolical mission is manna from heaven or hell; and is welcome, even if it’s from down under. Thus haven’t Australia’s covert instructions to its census staff to connect Tamil Eelam exclusively with Sri Lanka and, by so doing, indirectly legitimize its conceptual existence served to contribute to the terrorists till of forlorn hopes, the propaganda bonanza to make the guns boom and the blood flow in Lanka again in the name of an internationally denounced Eelam. The Australian High Commissioner Mr. Bruce Hutchesson has only said a cursory sorry for the secret internal guidelines getting out? Not for the instructions which take cognizance of a Tamil Eelam originating from Sri Lanka. Was that politically correct of him? Perhaps he would better understand the grievous hurt caused to Sri Lankan sensitivities should the Sri Lankan Government officially instruct its immigration officials to record that it is Australia and not some British penal colony that is being referred to, if some Crocodile Dundee comes to the immigration counter at the airport and tipsily declares himself to be from the aboriginal land of Oz. Especially, if he confirms his origins by singing its national anthem, Waltzing Matilda.